Oil stocks have seen a tremendous rebound this quarter. The Dow Jones U.S. Oil & Gas Index (DWCOGS) – which follows the performance of 80 U.S.-based energy firms – is up 6.4% this quarter. During the same time, the S&P 500 has gained only 0.9%. 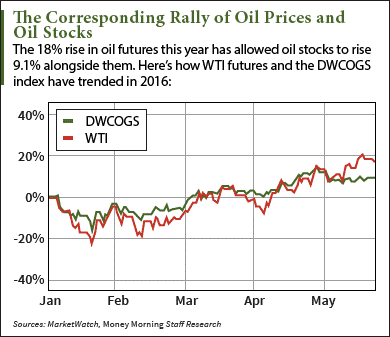 The rise in crude oil stocks has coincided with an even bigger rise in oil prices. Since March 31, West Texas Intermediate (WTI) crude oil prices have surged 27% to $48.66 a barrel. Oil prices are now at their highest level in over seven months. According to Money Morning Global Energy Strategist Dr. Kent Moors – a 40-year veteran of the oil and gas industry – oil prices have stabilized in the high $40 range. This means prices have essentially bottomed out and can only move higher from here. That's why today we're bringing you two of the best oil stocks to buy this year. Our experts believe these two companies are poised for market-beating gains for the rest of 2016. The first bullish factor for crude oil prices is flat-lining global output. Production in some of the world's biggest oil nations already peaked at record highs. Last January, total OPEC output hit a 19-year high of 32.6 million barrels a day. According to Reuters, Russia reached 10.91 million a day in March – the highest output in 30 years. It edged lower to 10.86 million in April. Domestic output has also started falling from last year's highs. The Energy Information Administration reported the United States currently produces 8.6 million barrels a day. That's down from a record high of 9.4 million last year. The second reason Brent and WTI crude oil prices will move higher this year is rising debt in the oil sector. You see, oil companies have been shutting off rigs at an unprecedented pace. According to Baker Hughes Inc. (NYSE: BHI), the number of active oil rigs in the United States has plunged from a peak of 1,600 in 2014 to 318 last week. That means 80% of the rigs that were operating in 2014 have closed. For many companies, rigs have become too expensive to keep online. Since oil currently costs just under $49 a barrel, U.S. producers can't make a profit from drilling wells that cost $500,000. Most companies can cover the cost of these projects when oil prices are in the $70 range. In other words, the juice isn't worth the squeeze. That means oil firms will have to keep canceling these expensive drilling projects to save money and alleviate their debt. As more wells go offline, more companies will eventually have nothing to do but file for bankruptcy or be acquired. This will lower the number of drillers, which will lower supply and lift oil prices. "The debt crisis in the energy sector is growing worse for many firms because they simply can't roll over their high-risk – or junk – debt and cover the huge annual interest rate of 21%," Moors said earlier this month. "This will cause a drop in the number of oil players – whether via M&A or bankruptcy." The third factor that will help lift oil prices is the conflict between Saudi Arabia and Iran. Relations between the two oil-producing nations have boiled over this year. After the Saudis executed an activist popular in Iran, the two countries have been riddled with violent protests. Now, Saudi Arabia is trying to edge out Iran's oil market. Saudi Deputy Crown Prince Mohammad is trying to convince the rest of the cartel to increase output since his country is the most powerful member of OPEC. This would help curb Iran's attempts to boost output to pre-sanctions levels and cut the country out of the global market. According to Moors, all three factors will lower supply and gradually push prices higher in 2016. Our first recommended oil stock to buy is Phillips 66 (NYSE: PSX). You see, Phillips is poised for growth thanks to its "downstream" services, meaning its revenue comes from refining and marketing. When crude oil prices are in the high $40 range like they are now, refining becomes the most profitable area of an oil firm's operations. Low prices make it cheaper for companies to make more gasoline and turn a profit thanks to consistently high gasoline demand. This is a big reason why Phillips 66 has smashed earnings estimates in six of the last seven quarters. PSX stock also boasts a generous dividend. Earlier this month, the company raised its annual dividend to $2.52 per share. That's up from its previous $2.24 dividend. The strong dividend is one reason why Money Morning Chief Investment Strategist Keith Fitz-Gerald consistently recommends PSX stock. He actually predicted three months ago that Phillips would boost its payout by a minimum of 10%. "Phillips is the perfect oil stock to buy because the firm actually looks out for its shareholders," Fitz-Gerald – a trader and analyst with more than three decades of global experience – told Total Wealth readers in February. "With a growing dividend yield of nearly 3% and payout ratio of 24.75%, the company is poised to hike dividends by 10% to 15%." Another oil stock Money Morning Global Energy Strategist Dr. Kent Moors is closely watching is Genesis Energy LP (NYSE: GEL). Midstream MLPs have limited exposure to oil price volatility. Since they transport and store oil instead of own it, they still make money as long as the oil keeps flowing. With U.S. production near a record high of 8.6 million barrels per day, oil is definitely flowing right now. That's why both Genesis and the broader MLP sector have been on a tear recently. While the benchmark Alerian MLP Index (AMZ) has surged 12% this quarter, GEL stock has soared 18.3% over the same period. "Midstream service providers are a company category I'm tracking for early indications of a bounce," Moors said on Feb. 29. "Namely selected master limited partnerships and related holdings of pipeline, terminal, and related assets." Both oil stocks are set for big gains over the long term. Analysts surveyed by Thomson Reuters give PSX stock a one-year price target of $89.86 – up 15.5% from yesterday's close of $77.82. The same analysts also forecast GEL stock hitting $40.25 over the same period. That's a gain of 7% from yesterday's $37.62 close. The Bottom Line: With oil prices at their highest level since October 2015, investors are finally dumping money into the oil market again. Oil prices are poised to keep rising thanks to peaking oil production, growing U.S. energy debt, and the Saudi-Iran conflict. That means more investors will be looking for oil stocks to turn a profit from rebounding prices. We recommend investing in Phillips 66 and Genesis Energy LP to make the most out of the oil price rally of 2016.